Thank you MWGS members who helped prepare the garden and served as monitors during the State Fair! Our mission is to increase the enjoyment and enthusiasm for water gardening through promotion, education and shared experiences. Our garden at the state fair welcomes the public, with our members available to answer questions from children and adults, to promote our mission. A special thank you to Lee Strong and Allen Eldridge for their leadership this year! And thank you, Geri Claytor, for scheduling monitors. 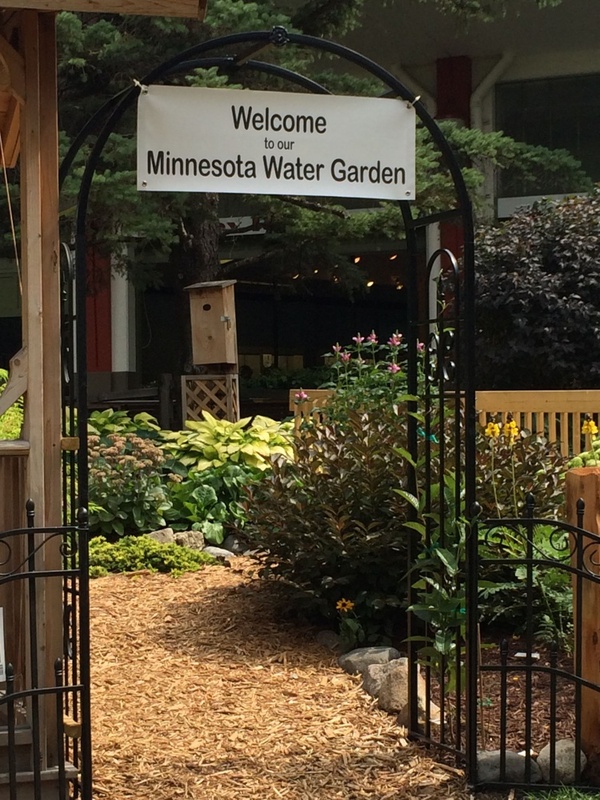 The Minnesota Water Garden Society built the pond and two streams in 2000 as part of the Adopt a Garden Program at the Minnesota State Fair Grounds. In 2014, a bog/filter system was installed and a path created to lead thousands of fair attendees through the lush garden. The MWGS State Fair water garden includes water features as well as a gazebo, bridge, container gardens and annual and perennial plants. One highlight is an unusual Jack Pine bush extending over the stream affectionately known as “Uncle Fogy” and lovingly cared for by a member also a bonsai expert. The garden pond water is circulated with a 5000 GPH pump in the bog/filter.. The water cascades down two streams to the 1500 gallon pond, over an infinity waterfall and through the plants and rock. Fish, water lilies and other water plants, as well as cattails, are permanent residents of the pond creating a beautiful and peaceful setting. This site, created and cared for by Minnesota Water Garden Society (mwgs.org), is open daily from 9:00 am to 6:00 pm. Thank you MWGS members who help prepare the garden and served as monitors during the State Fair! Volunteers are needed! Contact Lee Strong or Allen Eldridge to help prepare the garden and Geri Claytor to monitor during the fair!